Over at Ain’t It Cool News, Mr. Beaks gives us a teaser of the teaser of the new Star Trek film, and the L.A. Times proclaims that the villain’s identity is still a mystery. I don’t think so, not at all. Bear in mind that the identity of the villain was slipped inadvertently some months ago; Gary Mitchell. Karl Urban (who plays McCoy in the new films) stated (speaking of Benedict Cumberbatch, who plays the villain) “he’s a great addition, and I think his Gary Mitchell is going to be exemplary.” The Internet then exploded with speculation that Urban’s remark was a deliberate misdirection, planted by the ever-secretive J.J. Abrams to throw fans off the trail. For those who aren’t familiar with classic Trek canon, Gary Mitchell was the navigator of the Enterprise in the episode “Where No Man Has Gone Before”. An old friend of Kirk’s from their Starfleet Academy days, he gains psionic powers of telekinesis and telepathy that appear to grow in strength at a geometric rate. Eventually Kirk is forced to kill his old friend to save himself and the ship. That certainly sounds like a good description of a Gary Mitchell with godlike psionic powers to me. 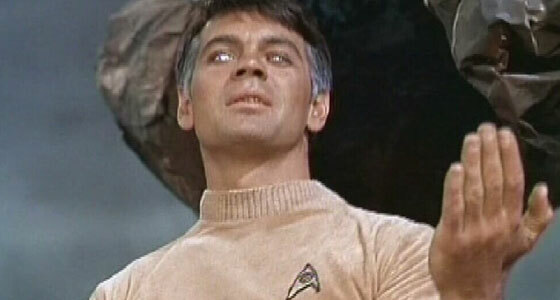 My thought is thus; Gary Mitchell, rather than having gotten his powers accidentally by contact with some deep-space phenomenon, is the result of some sort of experiment conducted by Starfleet (perhaps even Section 31). As his powers grow, they lose control over him, to the point where he destroys most of the fleet, ravages cities, and Kirk et al must deal with him once and for all. All just speculation, of course, but it does fit, I think. We’ll know in May! Please, if you haven’t done so already, consider supporting my Kickstarter for the Adventures Dark and Deep Players Manual, going on now through December 19th. I need your help to make it a reality! JJ Abrams is probably pulling tricks – making sure people think it's Mitchell or Khan. I'd put my money on this guy, though. I am with on this being Gary Mitchell. I even posted this to my Tumblr page. I think you're spot-on with that blonde in the teaser trailer being Dr. Dehner. First thing I thought of when I saw her. I'm guessing… both! The "danger within" is Gary Mitchell, and the "one man weapon of destruction," the only thing that can oppose him… is Khan! Dun da dun! I'm with scottsz, it's gotta be Garth… er, LORD Garth! that is. If the Abramverse was a complete reboot (as it should have been, NOT just a timeline change), then I would say anything would be possible including Kahn. Of course, considering how much ENTERPRISE with Capt Archer swiss-cheesed the timeline so much it would make Dr Who's head spin, it could still be possible. …and Peter Weller IS going to be in the next movie too, and I recall his ENTERPRISE character was a big eugenics fan.